Not only AUDUSD is affected by the Brexit issue but also the Japan upcoming stimulus measures is supporting AUD as well. AUDUSD continued its bearish trend since yesterday but suddenly grew up back again. 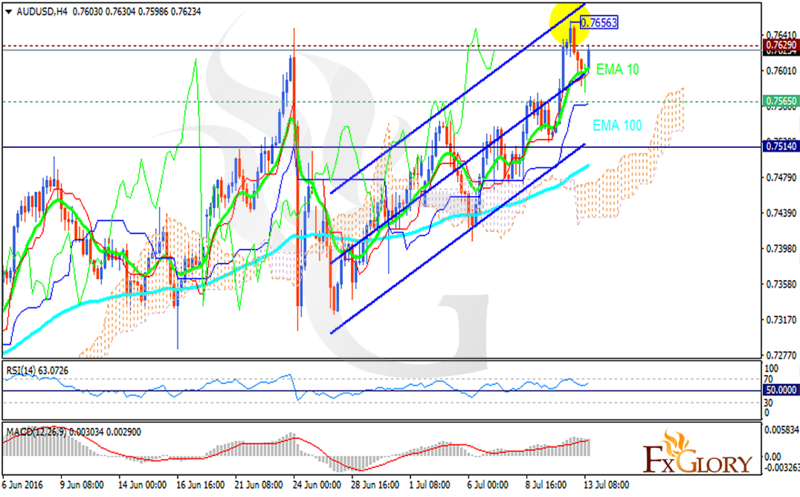 Now the support rests at 0.75650 with resistance at 0.76290 which both lines are above the weekly pivot point at 0.75140. The EMA of 10 is rising sharply above the EMA of 100. The RSI is above the 50 level and the MACD indicator is in positive territory. The price is above the Ichimoku Cloud and it is above the Chinkou Span. The Tenkan-sen is showing upward movement while the Kijun-sen is showing a horizontal movement. The pair is moving toward the resistance zone and the resistance level breakout will push the pair toward higher ranges targeting 0.7800.